This journey through the spectacular natural formations of the Grand Canyon, Zion National Park, Bryce Canyon, Lake Powell and Monument Valley will leave you stunned. Not only will you experience impressive sights such as the ‘hoodoos’ at Bryce Canyon, but also magical sunsets over canyons, national parks and rivers. 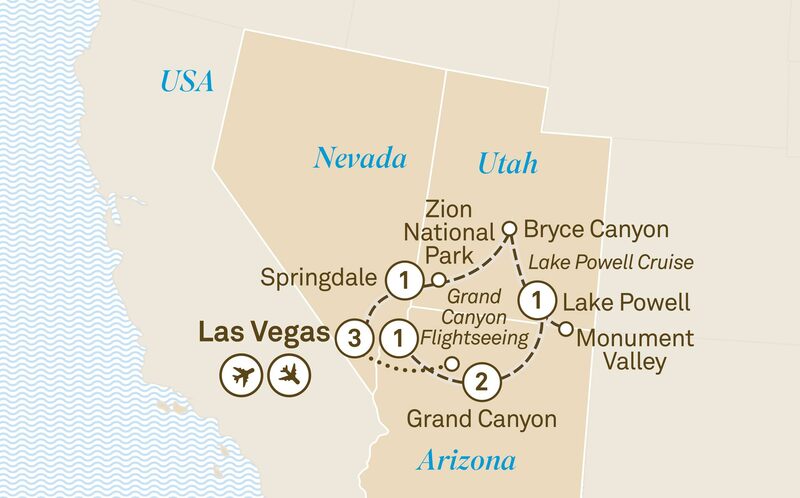 See the Grand Canyon from the air, take a jeep ride in Monument Valley and a lake cruise in Lake Powell. In the glittering lights and sparkle that is Las Vegas, you will have the chance to see a phenomenal Cirque du Soleil show. Welcome to fabulous Las Vegas, the ‘Entertainment Capital of the World’. Revel in its glitz and glamour during your three night Special Stay at the luxurious Bellagio Las Vegas. Each evening, be mesmerised by the spectacle of the famous Bellagio fountains dancing in front of your hotel, enhanced by music and light. Enjoy the performance from the comfort of your room.